Are you tired of winter and ready for some spring? Then how about bringing a bit of spring inside early by planting your own wheat grass! Here is my wheatgrass on the mantle. Beautiful! Wheat grass is versatile. Not only can you use it for spring decorating, but with a little planning (it takes about 2 weeks total) you can use it to replace that awful crinkly plastic stuff in your Easter baskets. You can also juice it, nibble on it raw, and feed it to chickens, cats, rabbits and guinea pigs. So how do you plant wheatgrass? Where do you find the seed? Well, I’m somewhat embarrassed to admit that I spent two years, on and off, looking for “Wheat Grass Seed” in the gardening section of big box stores and home improvement centers. . .
And then, finally, I realized. . . You have to buy wheat kernels or berries. You know, the kind you EAT. They sell them in the bulk food section of health food stores and such. I got mine at the Mennonite bulk food store-paid around $2 for a good sized bag. 1. Decide if you want to presprout your kernels/berries/seed or not. The seed I presprouted for 2 days took right off and grew. The ones I just planted took several days to catch up. 2. To pre-sprout: Take enough seed to eventually thickly cover the surface of your planting container. Place it in a jar and completely cover with warm to tepid water. Let soak for about 10-12 hours, then drain the water off. Rinse and drain with tepid water once or twice a day until you see the seeds begin to sprout. It took 2 days, but look at the little sprouts! 3. Fill your planting container with soil. The soil should end about an inch below the edge of your container for the most attractive appearance (the bottom of the grass will eventually turn yellowish white-this way the green stays up where folks can see it. Note: I decided to walk on the wild side and plant one container up that didn’t have drainage holes. It was an attractive round basket and I just lined it with a plastic shopping bag (it took me about 4 bags before I found one without a hole). I was very very careful not to overwater this container since there was no drainage. See how thick the seeds are on the surface of the soil? The round basket is the one I did not pre-sprout. 4. Water and cover the containers with plastic wrap to keep the moisture in while the grass begins to grow. Do not over water-the damp soil and the wrap should keep the seeds moist enough. The grass started growing within just a few days! 5. Once the sprouts are up move into the sun and let it grow! The grass is such a welcome sight. The smell of fresh grass was so delicious on a cold March day. So don’t fret~you still have plenty of time to grow your own wheatgrass for Easter! I will be starting another couple of batches soon, not only for my own Easter table, but in little pots (which I picked up at Dollar Tree, 4 for a dollar) to be used at the church Easter Dinner for decorations. If you want to see some other great ideas for using wheatgrass in decorations check out Martha Stewart’s Wheat Grass Centerpiece, Rosy Posy’s Eggcellent Easter Grass, Earth Affair’s collage of Wheatgrass Wedding Decorations, Limelight Floral’s Baby Shower Centerpieces and Occasions by Lisa’s roundup of Wheatgrass Decorating. And even better~any of the wheat kernels you don’t sprout you can EAT! Check out this great pdf from the Utah State Cooperative Extension on Whole Kernel and Bulgar Wheat. Love this idea. Thanks!! I’ll have to start mine this week!! This is a FABULOUS IDEA!!!!! So glad you guys like the idea! I just feel like such a goofball that it took me 2 years to figure out the whole “wheat seed=wheat berries/kernels” thing. Jenn-I would have thought the same thing! We did this a week ago with pots we bought from Home Goods, and we have lovely grass on our dining room table now! We couldn’t find the bag like you had around here so I just bought a bunch of smaller packets of “Catgrass” also called Wheat Grass but not sure if it’s exactly the same. But it only took a week to have something beautiful! We’ll be doing more now to decorate for Easter since it’s so easy and quick! My 4 year old loves it! And she gets to trim it, which is a special treat for her. Thanks again for the idea! Just pinned this! Great tutorial. Can’t wait to do this, thanks so much. I meant to write Mama and Baby Love…guess I am not awake yet! So glad you enjoyed it! 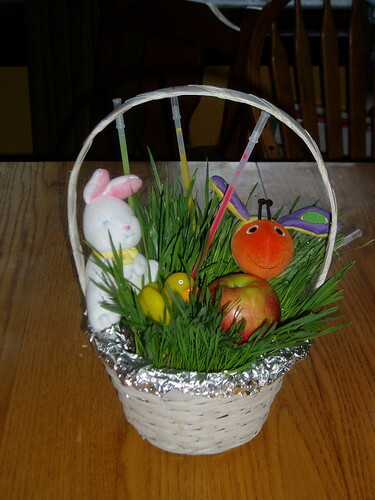 Its so cute & easy to do–my MIL wants me to do a basket of grass for her every year now. Totally love this idea. It’s both attractive and functional. Many thanks. I did this for years when our children were small, then got out of the habit. I couldn’t remember if I soaked the berries first, or just kept them damp with a sprayer until they sprouted. Thanks for the tips and refresher. Glad to bring back good memories! I need to get mine going for the year. . .